Dust storms have important climatic and environmental effects. According to the "iron hypothesis" proposed in late 1980s, dust containing nutrients (nitrogen, phosphorus, and iron, etc.) could exert a significant influence on the biogeochemical cycle in downwind sea regions, stimulate marine biological productivity, and reduce atmospheric CO2 concentrations. Since the iron hypothesis, scientists have studied the impacts of atmospheric deposition on the marine biogeochemical cycle. However, few studies have examined the direct link between natural dust events and marine biological productivity. In recent years, a series studies by Dr. TAN Saichun and Prof. SHI Guangyu from the Chinese Academy of Sciences and their co-authors found that significant correlations were observed between East Asian dust events and chlorophyll a concentration in the open ocean of North Pacific Ocean and also in the Chinese marginal seas. 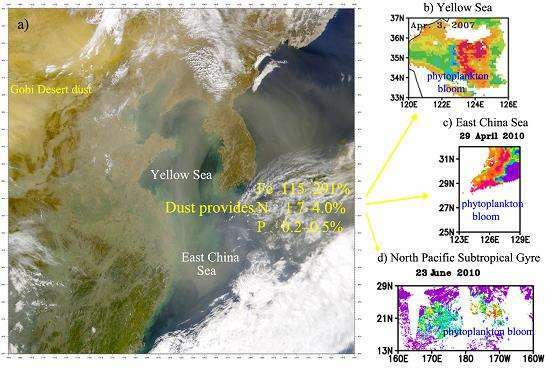 In addition to long-term statistics analysis, dust storm case studies also found that phytoplankton growth in the Yellow Sea was related to dust deposition, and peak chlorophyll a concentration in dust years was above 40 percent higher than that in non-dust years. Those studies suggested the effects of dust fertilization on marine biological productivity. Recently, the team investigated the transport process of East Asian dust events and quantitatively estimated the contribution of dust deposition to phytoplankton growth. They found that the combination of satellite-observed column and vertical properties of aerosol were able to show the transport of dust storms from the source regions to the research seas (Chinese marginal seas and southern North Pacific) and reduce the identification uncertainties of dust affecting the seas. The contribution of dust deposition to marine biological productivity was estimated from a model of simulated dust deposition flux. Results showed that dust containing iron was the most important factor affecting phytoplankton growth, and the deposition of iron via severe dust storms satisfied the increase in demand required for phytoplankton growth (115 to 291 percent), followed by nitrogen (it accounted for up to 1.7 to 4.0 percent), and phosphorus was the smallest one (up to 0.2 to 0.5 percent).